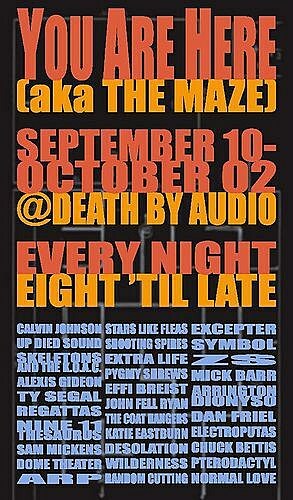 Remember Death By Audio’s 12-hour benefit on July 25th for something called You Are Here: A Maze? Sam Hillmer & Laura Paris, who dubbed their art collaboration Trouble, had the first You Are Here festival in 2007, at 44th street between Sixth Avenue and Broadway. Paris drew out the floor-plan of the maze, while Hillmer, who plays tenor saxophone for the Zs, booked bands to play in the space and coordinated efforts to bring people inside to interact with the maze. According to the promoter, “Medium and genre vary and overlapping and simultaneous performances are frequent, each performer establishing a different corner or dead end as his or hers.” Sounds fun. VIDEO DOCUMENT of “You Are Here: The Maze” by TROUBLE (Sam Hillmer & Laura Paris). EDITED by Matt Mehlan. FEATURING: Thee Oh Sees, Little Women, Skeletons, Colin Langenus, Dave Longstreth, Delicious Beverages, MV Carbon, Luke Calzonetti, People, Regattas, Random Cutting, Ugly Duckling Presse, Caitlin Cook, John Fell Ryan, Unicornicopia, Casey Farnum, Aaron Siegel, Lake, Fa She, Machinedrum, Mike Pride, Imaginary People and more…! Doors @ 8pm; performances 9pm – late EVERY NIGHT! You Are Here (AKA The Maze) is a performance festival in a sculptural maze taking place at Williamsburg’s Death By Audio from September 10 – October 2, 2009. Emphasizing the sprawling and interconnected nature of New York’s underground, a trip through the maze offers a peak inside NYC’s diy art/music scene. A meditation on passage and desire, You Are Here engulfs the space and presents beckoning inhabitants, dead ends, and uplifting epitaphs. Medium and genre vary and overlapping and simultaneous performances are frequent, each performer establishing a different corner or dead end as his or hers. Participating artists in the 3-week festival include Skeletons and the Kings of All Cities, Zs, Excepter, Mick Barr, Effi Briest, Extra Life, Katie Eastburn (of Young People), Stars Like Fleas, Mike Pride, Dan Friel, Ninjasonik, Vaz, Pygmy Shrews, Nine 11 Thesaurus and many many others. A full performance schedule will be announced on 8/12/09 but should be used only as a loose guide. You Are Here subverts prefab expectations for both audiences and performers–there is no prescribed order, start time or end time, duration, location of performance, relation of audience to performers, and so on. All of the participating artists have been asked to create something site-specific since the performances will, in fact, take place within the maze. Audiences will be asked only to expect something unusual. The anti-festival festival OR why this festival is different from all other festivals. 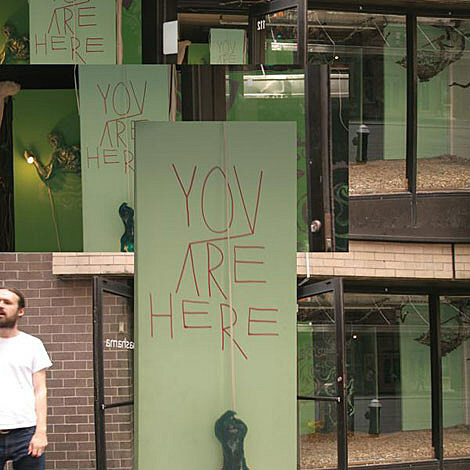 You Are Here was first presented by Trouble at Chashama’s Visual Arts Space in Midtown Manhattan. This year’s maze returns to Brooklyn and is a real for us by us type of affair. You Are Here is a festival drawn from within the scene, not the work of corporate sponsored parties wishing to develop markets. No one gets free shoes or gift bags full of stuff and the festival doesn’t push any specific beverage or brand. This festival also won’t fly people in from all over and make a big super-festival. You Are Here is a local affair, mostly local bands will play, and many of them have personal and ongoing relationships with each other and with Trouble. You Are Here is about Brooklyn and about the diy scene in New York in general. It’s about activism and about relationships and about immediacy and not least about a community that, perhaps in spite of the internet, still exists on a local level. You Are Here is also about domesticity in several senses, not least of which is the fact that the artists Trouble (Sam Hillmer and Laura Paris) are in fact a married couple with a child and a home in Bushwick which also houses both of their studios. As any one who is an artist knows, your relationship is either part of your creative life or it’s competing with it. Trouble plants themselves firmly in the first category with their work together on the maze. Together, they are devoted to creating extreme environments that have no exterior, public art both condoned and illegal, and other kinds of visual/sound art intended to be used for some purpose. Their work is about community, spirituality, politics, craft, and beauty. Outreach is a part of all of their projects, as is what they call “in-reach”: designing events that strengthen the ties within the DIY art community and the art world as a whole. The inspiration behind the imagery in this year’s Maze project includes “the six realms” from Tibetan Buddhism and other elements of Buddhist cosmological theory.